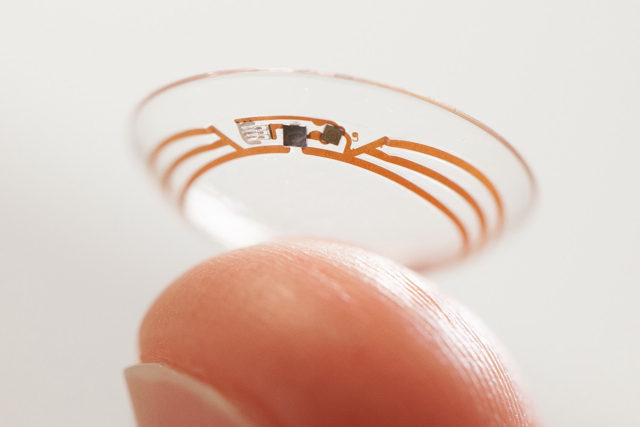 Google has invented a new camera component to integrate into its future Google Glass-related smart contact lenses. These sophisticated lenses will allow users to control a tiny camera using the owner’s blinking patterns. The embedded camera will be able to capture and process an image to perform local functions in the contact lenses or on a remote device. This new technology may also be able to provide on-the-spot facial recognition or help blind people see. “The image data can be processed to detect light, colors, patterns of colors, objects, faces, motion, or any other suitable information that can be derived from processing one or more images,” explains Patent Bolt. Because the data processing could communicate with a remote device, such as an Android smartphone, users would not be restricted by the lenses’ limited capabilities to store, access, and interpret the image data. The data processing could potentially help blind people see because the smartphone may be able to offer voice commands based on its interpretation of the images from the smart contact lenses. The analysis component of the technology can detect movement from a series of images taken over several instances of time. Therefore, the lenses may be able to assist blind people in avoiding moving obstacles. Also, the tiny camera’s facial recognition feature has the possibility to be used in many professional capacities. Law enforcement may be able to quickly match the image of a suspect they may have stopped for questioning to an image in a criminal database. Because of the camera’s ability to zoom, healthy lens wearers may be able to use the camera as binoculars. Unfortunately, the smart contact lenses probably will not go on the market for some time. Google filed the patent for this technology in 2012, but the U.S. Patent Office did not publish the patent application until earlier this month.